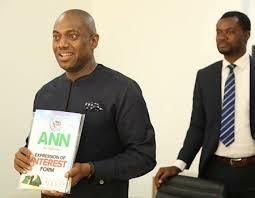 Fela Durotoye picks ANN presidential nomination forms – Royal Times of Nigeria. Presidential aspirant, Fela Durotoye, on Tuesday picked up the nomination and expression of interest forms, formalising his intention to contest the presidential seat of Nigeria. Durotoye who took his Twitter account to announce the development praised his supporters for donating and making it possible for him to obtain the ANN presidential nomination forms. It will be recalled that the leadership expert and business had earlier charged the public to donate towards the purchase of the 3.5 million naira nomination form to enable him contest in the presidential primary election of the Alliance for a New Nigeria (ANN).